click here to see Quinton, PA Company Store currency! Henry Bayard and Company had 21,000 acres in Sergeant Township and overflowing into Elk County. About 10,000 acres were drained by Five Mile Run and would be cut by Henry Schimmelfeng at Instanter, PA (Elk county). The remainder was drained by Instanter creek. S.H. Moore had started cutting part of it near Clermont but operating less than a year (he had a mill below Anderson Grove Farm on Red Mill Brook). 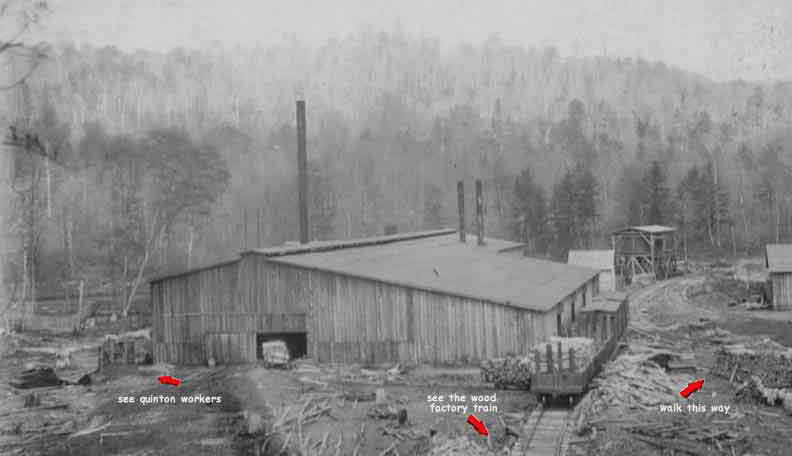 Quinnwood was a typical temporary sawmill community with the mill, a company store, and a few makeshift homes. Martin F. Quinn was administrator, F.S. Sherman ran the mill and Thomas H. Quinn was the wood boss. The mill operated five years, and the lumber from Quinnwood was used to construct Straight, PA two miles south of Instanter on the Clarion River. T.H. Quinn lived at Straight until he retired in 1914 and moved to Olean. Quinton even had their own currency which the workers used to purchase goods at the Quinnwood Company Store, pictured below.